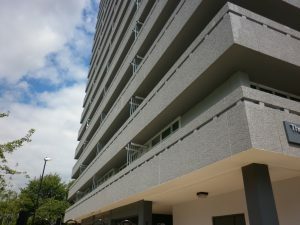 We’ve completed a number of projects lately to non-traditional properties and high rise blocks where we’ve had to consider the effects that concrete carbonation has had on the structure. This has included quantifying the number of defects to allow us to go out for tender on concrete repairs. Apart from the localised repairs, there is a further consideration with regards to how we limit the future effects of carbonation. Concrete is a highly alkaline material and if un-carbonated it has a pH in the region of 12.6. Carbonation starts on the surface of the concrete and can ultimately reach the depth of the steel reinforcement within the concrete. Reinforcement bars are required in most concrete structures as concrete is strong in compression but weak in tension, therefore reinforcement is added to provide tensile strength. The alkaline state of the concrete provides a passive resistive layer to the surface of the steel reinforcement that prevents corrosion. Once concrete comes into contact with carbon dioxide and other pollutants within the air, then a reaction may occur. Carbon dioxide can form carbonic acid with the water in the cement that then neutralizes the alkaline state of the concrete. If this happens, then carbonation moves through the concrete as a front that gradually reduces the pH value to 8pH; neutral is 7pH. 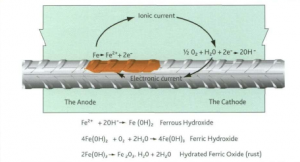 However, corrosion to the reinforcement can occur if the pH value falls below 11pH. Different factors determine the timeframe of carbonation, such as the quality of the concrete. For example, if the cement is very porous or has low cement content then the timeframe will be significantly quicker than if the concrete is not very porous and has high cement content. The term concrete cover relates to the distance from the embedded reinforcement to the outer surface of the concrete. This distance is significant for structural integrity, durability, protecting the reinforcement from corrosion and fire. Ordinarily we wouldn’t want to see less than 50mm of concrete cover, yet many non-traditional buildings built in the 50s and 60’s had less than 10mm of cover in places. The concrete cover can be accurately measured using a cover meter which is a non-invasive device. The cover meter uses electromagnetic pulses to determine the location of the reinforcement bar. ‘BS 1881-204: Testing concrete’ should be referred to for information when using electromagnetic cover meters. We use a Kolectric MC8020 micro cover meter. If the concrete cover surrounding the reinforced bar is insufficient then the bar will be susceptible to corrosion as the carbonation front does not have far to travel. Once the passive resistive layer is lost then the embedded steel will start to corrode. Corrosion is an expansive reaction and it is this expansive reaction that causes cracking and spalling of the concrete. 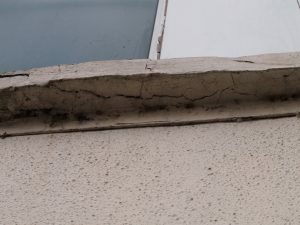 Cracks allow direct water ingress which can further accelerate the deterioration of the concrete . In particular, concrete framed buildings built from 1950s to the late 1960s had insufficient depth of concrete cover. 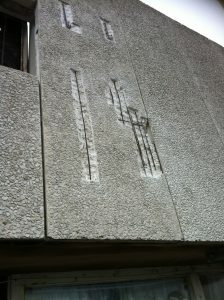 It was not unusual for the reinforcement bars to corrode causing the covers to crack and detach over a period of time. It was particularly common in the 1950-1960s due to architects striving for an aesthetically pleasing property. Recently we worked on a project in the West Midlands, a concrete framed block of flats. 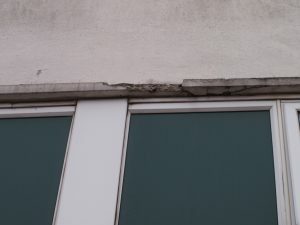 There were many defects throughout the property including concrete carbonation and we were required to write a concrete repair specification after completing the initial survey work. 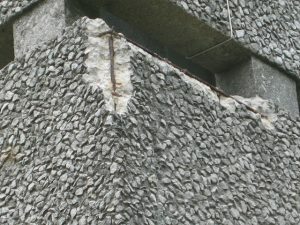 The adjacent photograph shows a reinforced concrete lintel suffering from carbonation. This is most likely due to an insufficient concrete cover which over time results in the reinforcement bar corroding when carbon dioxide and water affect the concrete. 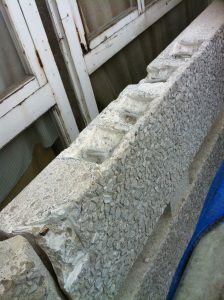 Subsequently, the alkaline value lowers in the concrete therefore increasing the risk of corrosion to the reinforcement. As previously mentioned, the rate in which carbonation spreads to greater depths depends on the factors of the concrete and the environment. However, concluding the depth of carbonation is important and it can be determined by using a Phenolphthalein indicator solution. The solution consists of 1g Phenolphthalein dissolved in 50ml of alcohol and further diluted with 100ml de-ionized water. This solution is applied to newly broken concrete; if a purple stain occurs on the concrete then the pH value is above 9 which means carbonation has not taken place. However, if the solution applied to the concrete remains colourless then there is a value of below 9pH – this means that carbonation has occurred. The depth in which the coloured solution travels depends on how deep the carbonation has reached. It is important to leave the tested concrete for a period of 24 hours until measuring the depth. Precast panel having rebar descaled ready for concrete repairs. Preventing and slowing down carbonation in concrete is a simple method. Anti-carbonation coatings can be applied to the cleaned surface of the concrete to prevent the ingress of carbon dioxide and other pollutants. This method should prevent carbonation for approximately 10 years. Rebar prepared for repair mortar. 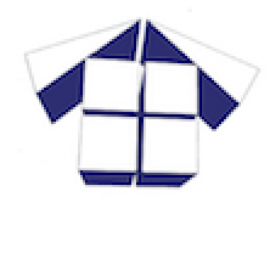 However, if carbonation has already taken place , then the repair methods are not as straight forward. To repair carbonated concrete with exposed reinforced bar the following steps are required. Firstly, the works should comply with EN 1504: Principle 11 – Preventing Corrosion of the Steel Reinforcement. The reinforced bar must be descaled and cleaned ready for an anti-corrosion coat to be applied. This coat isolates the bar and protects it from water and chemicals that could cause further corrosion. Next the missing concrete needs to replaced; if a higher cement to water ratio is used then carbonation will be a slower process. Furthermore, once the repair mortar is set then an anti-carbonation coating can be applied to prevent carbonation of the concrete. This is amazing.I am glad that I came across your article.Gained lots of information about why concrete is important and how it protects from corrosion of the metal .